(eco)mpassion's semi-annual warehouse sale is starting Monday. Find brands like Theory, DVF, Nanette Lepore, Loomstate, Vince, and more. Vince has some stuff on sale for both men and women. Not tons, but what's there is fairly cheap (for Vince). They have this pretty awesome leather dress left in small sizes (which, let's be honest, is totally required for a dress completely made of leather). Visit a Catherine Malandrino boutique near you and see what goodies you can score. From now through Saturday, the FW 08 collection is 70% off. I might just have to swing by and see what dresses they have... There is some stuff online on sale too, but not very much. Womens fur coats, mens shearling, and fur-trimmed cashmere sweaters. If you need to luxe it up in this frigid cold, this sale's for you. There will also be RTW, handbags, accessories, jewelry, and home furnishings. Although Paul Smith is mostly known for their colorful menswear and tongue-in-cheek accessories, they are increasing their womens items as well. I am a huge fan of their socks and cufflinks (which are under Mens Accessories). If you shop the online sale, know that the womens clothing runs small, and they have a good selection of scarves, hats, and gloves. Why: Major discounts on fall and spring merch. Pants from $60, tops from $50, and shoes from $75. When: Jan. 29-Feb. 1. Thurs. & Fri., 8:30 a.m.-6:30 p.m.; Sat. & Sun., 11 a.m.-5 p.m.
Why: Up to 75 percent off vintage, ready-to-wear, and bags. When: Jan. 28-Feb. 1. Wed.-Sat., noon-8 p.m.; Sun., noon-7 p.m.
Where: 143 Ludlow St., b/t Stanton & Rivington Sts. (212-505-2650). Why: Up to 75 percent off retail on fall and resort items from ’08. When: Jan. 30-Feb. 1. Fri., 10 a.m.-7 p.m.; Sat., 11 a.m.-7 p.m.; Sun., noon-6 p.m.
Where: 21 Bond St., b/t Bowery & Lafayette St. (212-529-8790). Why: The event and design production firm has nowhere to store their old party stuff — so they’re selling it. Find crystal chandeliers, pillows, candles, and tons more on the cheap. When: Feb. 6. Fri., 10 a.m.-8 p.m.
Where: Union Square Ballroom, 27 Union Square W., b/t 15th & 16th Sts. (212-645-1802). Cash only. All of the remaining 2008 stock at Temperley London is marked up to 80 percent off. The mini kaleidoscope dress was $1,295 and is now $323, and a tunic was $995 and is now $248. When: 1/30–2/1; Fri. (8–7), Sat. (11–7), Sun. (12–7). Where: 453 Broome St., at Mercer St., second fl. (212-219-2929). Daily Candy is doing a promo with White + Warren. Use code "DCDEALS" and take 25% off anything, even sale! Expiration unknown. 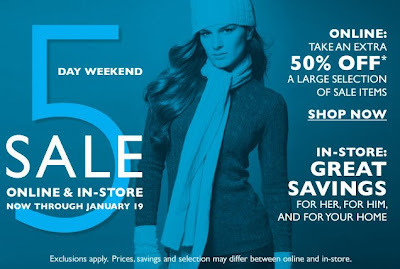 Kicking off today: Inhabit's semi-annual cashmere sale! Womens $80, Mens $100, and free shipping to boot! Sale ends Wednesday, Jan 28, so hurry because come Thursday it will be all brand new Spring items. Not like I can even think of spring in this 23 degree (F) weather. I joined SaksFirst during the 80% off melee, and now I get all sorts of notifications (read: semi-junk mail)! This one is good, and I think not restricted to SaksFirst members if you buy online. Starting Tuesday, Jan 27, use code "BEAUTY9" to take $25 off $100+ cosmetics, fragrance, and skincare purchases*. To shop in-store, you'll need the postcard they sent you with the barcode. Ends Saturday, Jan 31. Until Wednesday, Jan 28th, Catherine Angiel is having a Winter Sale and taking 10-20% off their entire inventory, which they have never done (as far as I'm aware). Usually her signature pieces of engagement rings, wedding bands, and black diamonds remain full price as other things are marked down. Not a bad time to swing by if you're in the market for wedding or artisan fine jewelry. As a little feel-good bonus, a percentage of their sales will go twards St Jude Children's Hospital. 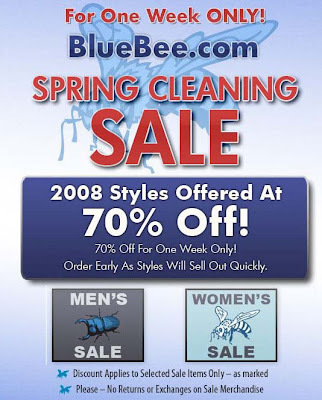 BlueBee.com is having a spring clearance sale up to 70% off. Mens and womens, and free shipping if you go through my link (no coupon needed). Ends Thursday, Jan 29th. 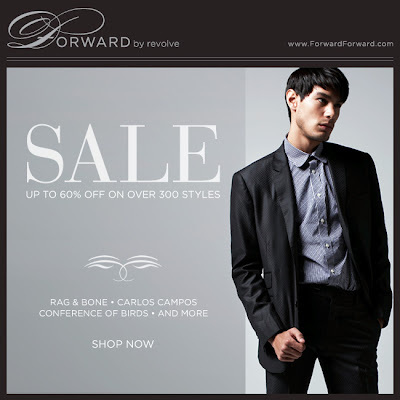 Forward by Revolve is having a sale for men! Looks like 40-60% off brands like Rag & Bone, Gilded Age, Superfine, and more. With the recession going strong and consumer confidence weak, I predict this will one helluva sale. This is when I start sorely wishing I lived within (affordable) cabbing distance of any Neiman Marcus! Sources say CoSTUME NATIONAL is having a 2-day sales event on mens and womens RTW, shoes, and accessories. FW08 goods up to 75% off. I am so there!!! It's going to be huge and adorable! I hope everyone who had a long weekend (like me) enjoyed it, and everyone else who had to work at least had an easy day yesterday. Ok, back to business. 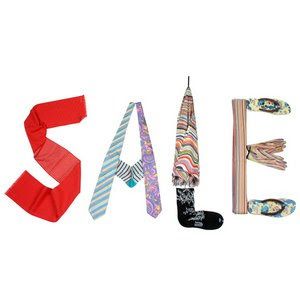 From Top Button: a Valentino & M Missoni sample sale for mens and womens, up to 70% off. It sounds like it will be huge, from shirts and accessories to couture gowns and items from other designers like Notte by Marchesa, Carmen Marc Valvo, Alexander McQueen, Andrew Marc, and Badgley Mischka. If anyone goes, please report back! In honor of MLK Day, Kenneth Cole is having a blow-out sale. Ends Monday, Jan 19. Bloomingdale's started a 5-day weekend sale. Print out the email and get an extra 15% off in-store or use code "ESALE" online. Ends Monday, Jan 19. At the John Varvatos friends and family sale, the fall and winter merchandise is up to 70 percent off. Tweed jackets are $420, leather jackets are $600, and boots are $200. When: Through 1/17; call for hours. Where: 122 Spring St., nr. Greene St. (212-965-0700); 315 Bowery, at Bleecker St. (212-358-0315). Gilt.com has snuck in another last-minute clearance for men! Starts at noon EST. But not bags. Also in related eLuxury news, Racked.com has reported that eLuxury will close soon. Aww. Let's hope there's a silver lining: an all-out blow-out closing sale. Take another 40% off sale merchandise at Calvin Klein, making prices effectively up to 70% off retail. 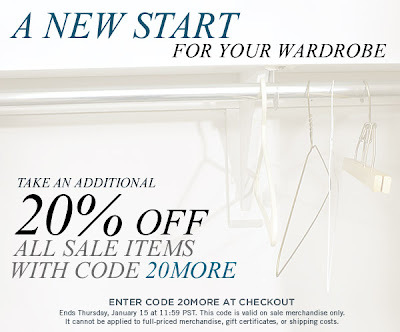 Use code "20MORE" to take an additional 20% off ShopBop sale items. Ends Thursday, Jan 15. 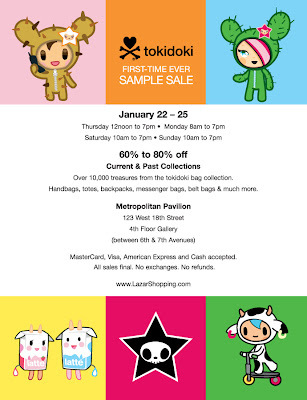 The first sample sale I am excited about in 2009! sorry J.Crew. Cole Haan is having a mens and womens sample sale for their shoes, bags, and outerwear. Prices will be up to 80% off. I felt it was time to mention this much-ballyhooed J.Crew sample sale. Held by Clothingline, the sale will cover the entire spectrum of all-things-J.Crew: mens/womens/kids clothing, shoes, and accessories, wedding dresses, bridesmaids dresses, and even dog clothes and accessories for Fido. 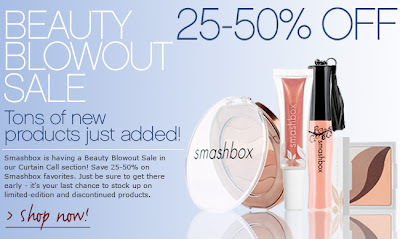 Smashbox has added more items to sell fast in their "Curtain Call" section. 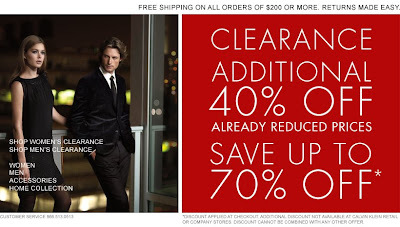 Neiman Marcus Last Call is an additional 20% off today and tomorrow. Use code "NMSHOP" for free shipping if you spend $200+. When/Where: Monday, January 12th through Friday, January 16th. Daily 11am—7pm. Redbag, 250 W 39th St between Seventh and Eighth Aves (no phone). 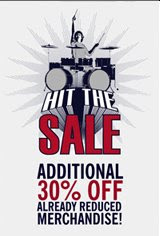 Ben Sherman is taking another 30% off their current sale merchandise for both men and women. Prices are effectively 50% of retail. Me & Ro has slashed the prices of some silver and 10K pieces for their Winter Sale. Ends Sunday, Jan 18 or when everything is sold out. 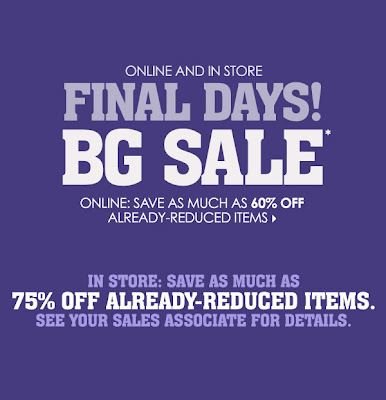 That sale that Saks threatened to end has still not ended, and is now marked down more. 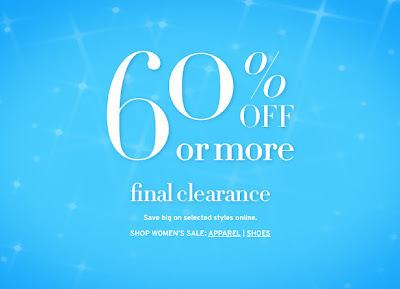 Up to 80% off! Prada reduced ready-to-wear-collection prices to 60 percent off, and bags are 50 percent off. Run! 2009 is off to a slower start than I anticipated, but hopefully sample sales will ramp up soon. I'm not not trying to be a slacker. First up: hipster messenger/carry-all bags by Manhattan Portage via Token private label. 50-60% off on sample merchandise, which includes messenger bags, backpacks, laptop bags, briefcases and totes. 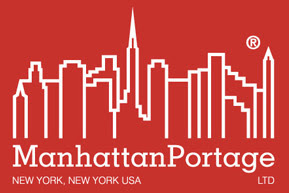 and a logo to trigger your mind if you're not familiar with the written text "Manhattan Portage"
YOOX.com has taken their 3rd cut at 08's Fall/Winter clothing. Womens and Mens. In-store and online. Prices look pretty good. End date unknown. Check out the Longchamp boutique nearest you for their sale. Starts Thursday, Jan 8th. 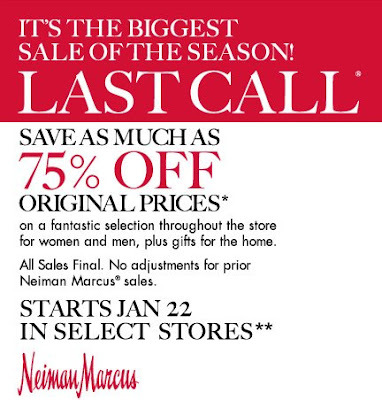 Neiman Marcus is having their biggest Last Call sale of the season (by which I think they mean winter). Online only. Per Top Button. A friend also reported that she scored Uggs for $69 (retail $300~). Shoe-Inn's 13th Annual Warehouse Sale features over 10,000 pairs of women's designer shoe collections by Tory Burch, Ugg Australia, Jessica Simpson, Marc Jacobs, Chloe, Celine, Donald J. Pliner, Michael Kors, Kate Spade, Kors, Juicy Couture, Stella McCartney, Frye, Matt Bernson, Stuart Weitzman, Kate Spade, Burberry, Pedro Garcia, Robert Clergerie, Zalo, Miss Trish, Roberto del Carlo, Acqua Italia, Pucci, DKNY, Ralph Lauren, Anne Klein, Puma, Cynthia Rowley, Calvin Klein, Miss Sixty, Converse, Lilly Pulitzer, D&G, Charles David, Moschino, Steve Madden, Kenzo, Betsey Johnson, Fieramosca, Minnetonka, Jack Rodgers, Fitflops, and many others. A representative of seriously chic boutique agnès b. has informed me that they are having a 50% off sale in all their stores, and, if you join their mailing list, they'll be sending 10% off coupons in the near future! Select sweaters and cardigans are 60% off at Vince. I will also add that over Xmas break I went to visit my parents, and where they live doesn't have a whole lot of shopping options. I spent my time browsing Target, Wal-Mart, and TJ Maxx. Imagine my surprise when I found Vince sweaters at TJ Maxx for $99. In Columbus, Georgia. 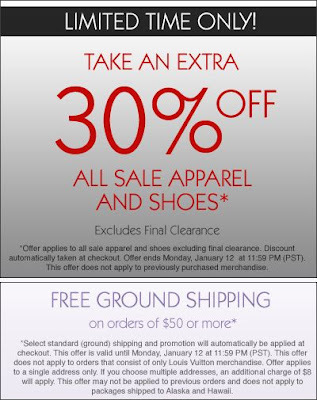 Bloomingdale's is having an additional 50% off sale merchandise through this weekend. There is a huge cache of Aqua Cashmere sweaters available now (at the NYC store location) from $50-55 (retail $99-148). There's not a whole lot else of great finds, as most of the things are remnants of previous sales.